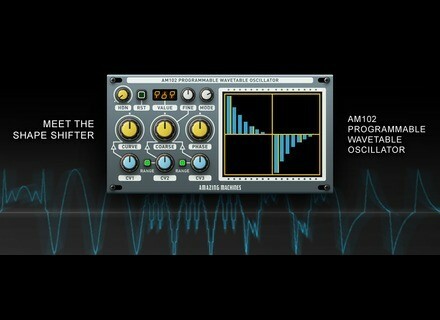 AM102 Programmable Wavetable Oscillator, Virtual wavetable synth from Amazing Machines. AM102 is a programmable wavetable oscillator that features a 16 Stages Wavetable with 3 selectable Playback Modes and 3 types of Output Curves.You can click and drag the faders in the Wavetable Display to draw your own Waveforms, use the CURVE and MODE controls to modify Waveforms even further, connect AM102 to a FREE AM103 Expander Module in order to control the Modulation Inputs of Stages 1, 5, 9 and 13. Compatibility: Native Instruments Reaktor 6.0 or newer (Full Version). Halloween sales at Realitone Realitone offers special prices on some of its Kontakt virtual instruments, including the Ladies series. MeldaProduction's promos of the week This week again, MeldaProduction offers 50% off five of its products, including the recently updated MDrummer. Special prices at PSP Audioware Until October 27, PSP offers special discounts on its Echo and Pianoverb 2 plugins.